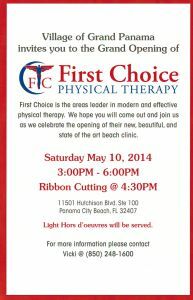 We are looking forward to seeing you at our Grand Opening on Saturday, May 10th. There will be tours of the facility and at 4:30pm Panama City Beach Mayor, Gayle Oberst, will be on hand for the ribbon cutting. Do you need more reason to come out? How about Cake? Light hors d’oeuvres? Sodas and tea? You still need more? You guys are a tough sell! Ok, lets step it up with a little help from Hess Entertainment. We will have Garth Brook’s old tour bus and internationally known Elvis impersonator, Todd Harrington has agreed to give us a little bit of sample of his awesome tribute to The King! Seriously, we will be there from 3:00 – 6:00. Swing on by. Stay for a few minutes and see the beautiful new clinic or stay the whole time and enjoy the afternoon with us.